As much as I look forward to those crazy kitchen sessions, ensconsed at home trying out new recipes to share on the blog, there inevitably comes sessions when I turn into a human mass spectrometry analyser, the minute I get my boarding pass in hand. My other half calls it the 'driving cabin crew crazy' phase. 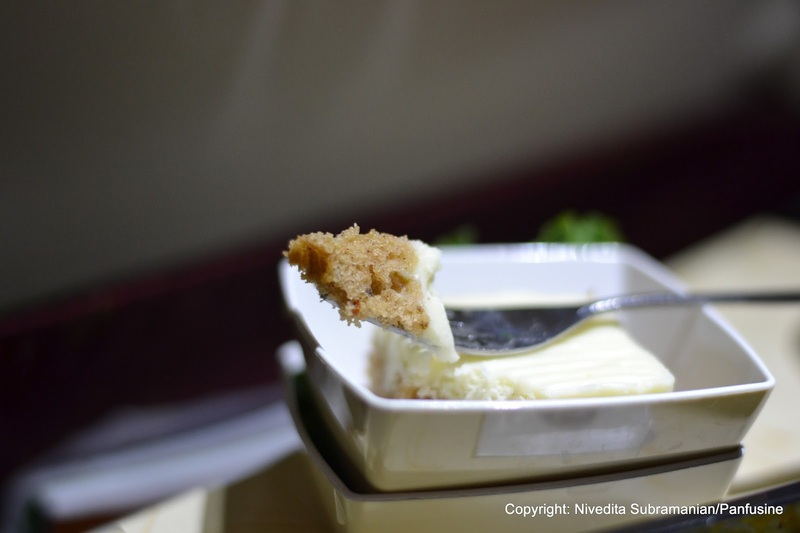 I chew (food), analyse (the taste) and spit out (my opinion) on the food that is served up on a long international flight. Then follows the barrage of questions to the crew that is always answered very helpfully. Its a delight to travel with such a wonderful crew as I did earlier this week in Jet Airways' flight from Newark to Mumbai via Brussels. 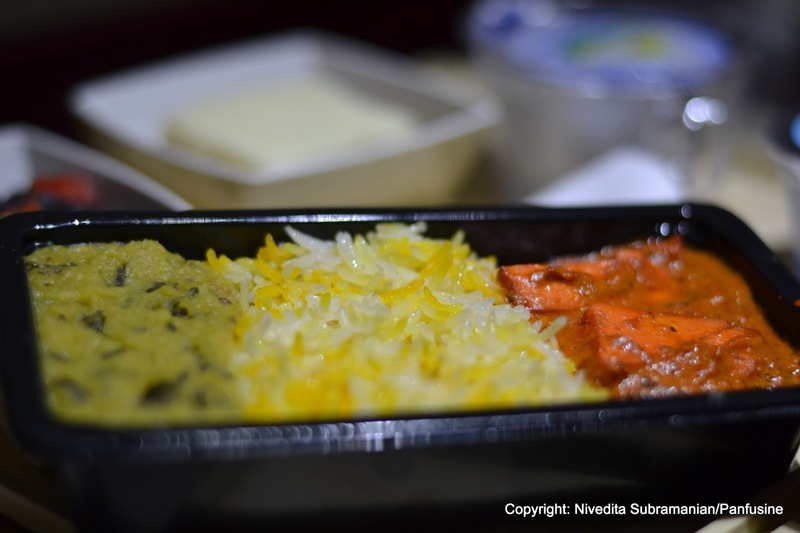 Jet airways (as do most airlines) has a dedicated team that works with various culinary establishments the world over to design the menu for all their three classes of travel. The menu is changed every month and there are 3 or 4 sets of menus that get rotated through out the year. For the premium classes, they have Michelin star chefs (such as Yves Mattagne,) who designs their western food menu. Human physiology is not designed by nature to operate optimally at 35,000 feet in a pressurized can and the entire experience of savoring food at high altitudes is different from what you enjoy at the dinner table at home. First, the olfactory (smell) senses go for a toss. Since most of the tasting experience is actually done by the nose (which gets seriously compromised in the high altitude, pressurized environment), only the strongest & most assertive of aromas get detected .. Not a good thing - almost everyone has experienced the aroma of egg salad or garlicky curry wafting from the seat 3 rows ahead, haven't we? Thus the tongue has to take on the added responsibility. 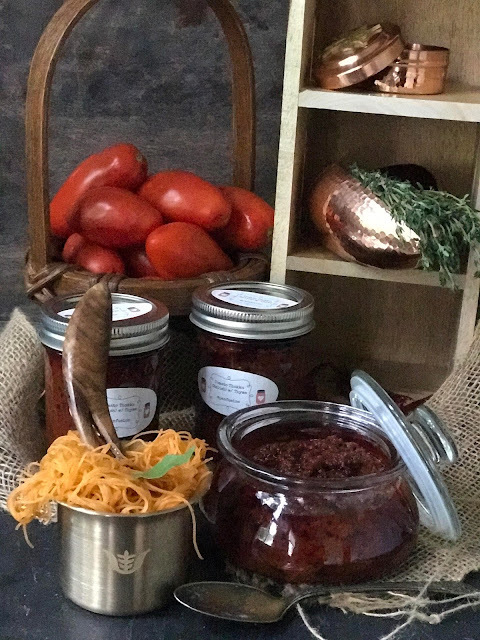 There isn't much one can do in terms of changing the four parameters that the taste buds can identify, especially when the food is being served to 300 passengers, The onus is on creating variations in texture that appeals to the palate. Creamy is good, gritty is not. There were two different food uploads, I'm not sure about who the Jet airways caterers are on the EWR - BRU leg, but kudos for presenting a decent dinner offering. So here's my 2 cents worth. The wine on Economy was a Sauvignon blanc from Chile (Concha y toro), generic enough to cover all palate sensibilities. The salad on the meal tray was a black bean, corn and roasted red pepper salad. A good contrast to the usual wilted lettuce leaf , dried out cucumber slice (topped with a single black olive from a can). Black beans tend to have a glutinous texture that works well on the deprived palate, and even though the beans were a tad mealy, the overall tanginess from the vinegary dressing pushed this into the 'good' category. 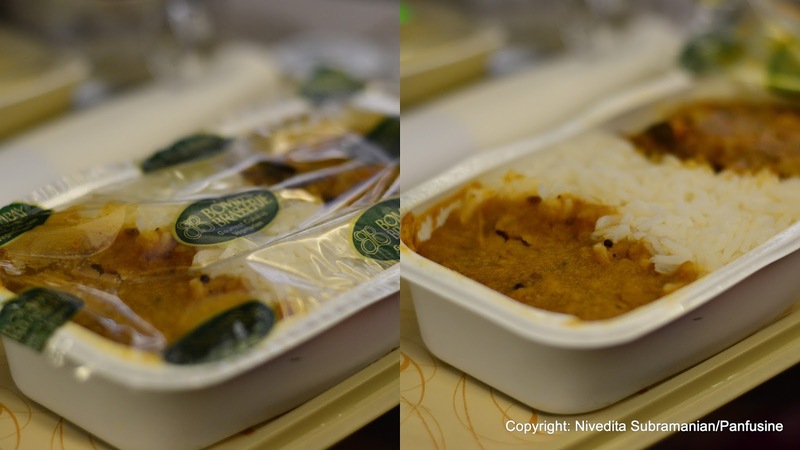 The Main meal tray consisted of a Paneer makhani, a garlicky mung dal and basmati rice spiced with cloves. Paneer is always a great option for Indian meal uploads, since it retains its chewy texture well at high altitudes and the milk fat in the cheese confers a creamy sensation on the palate. The spiced rice was surprisingly quite tasty, the heated up rice was soft and without being dry, and the cloves added a nice sharp flavor that managed to hit the olfactory system effectively. The garlic in the mung dal was rather strong, and the dal was cooked down almost to a paste, but the overall combined effect was good enough to polish the entire serving. Desert was a spiced cake square with cream cheese frosting. the baked part was your average offering that you find in any coffee shop, but the cream cheese frosting tended to cover up and compensate the slightly dry texture well. Just the right amount of sweetness. 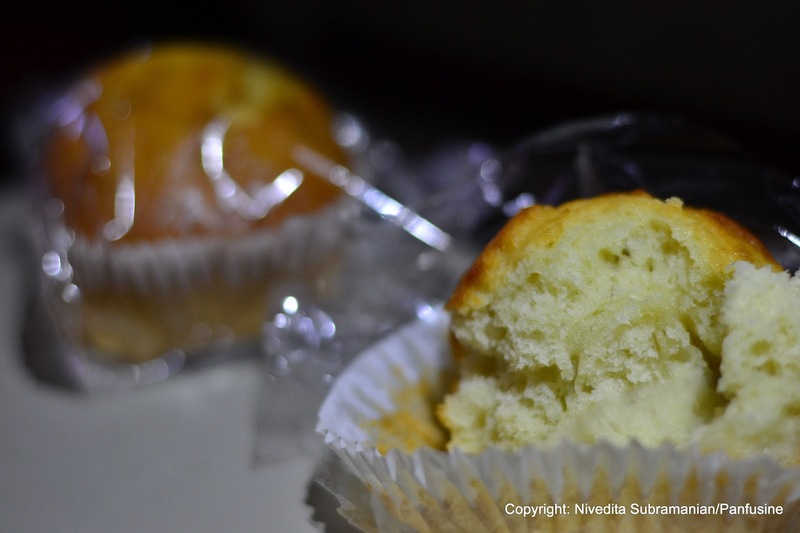 The snack provided prior to landing in Brussels was the classic banana nut muffin you find at Rest Area vending machines. The aroma of the fake banana extract was matched only by the acrid sensation of the preservative that they use to prevent spoilage. Left practically untouched after splitting open the 'confection' for the photo - op! The catering for the Brussels Mumbai leg is undertaken by LSG sky Chefs, but the actual planning for the menu is done by the Jet Airways team in collaboration with well known restaurants in Europe. The restaurant for this particular leg was Bombay Brasserie based out of London. 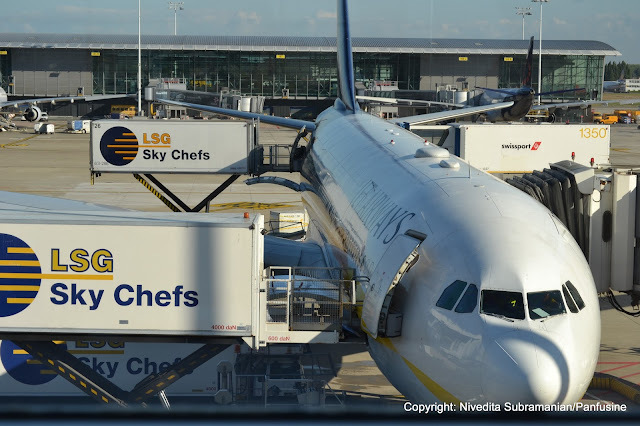 The food for economy class is prepared 48 hours in advance in London, frozen & flown to Brussels where its uploaded onto the various Jet Airways flights flying out of their Belgian hub. I had never heard of this restaurant before, but their website appears to market the establishment as a high end eatery. If they intend the food served on board to be a food sampler advertisement for the actual restaurant, They may as well be closing down in due course. Just as there are taste memories associated with good food (one such wonderful memory was the on board food festival on Air India in Dec. 2002 by Chef Sanjeev Kapoor), there is a set that latches itself with bad food as well, and the Bombay Brasserie offerings take the proverbial cake (& the bakery) in the bad category. The Salad was a potato chaat. It tasted like it came out of a ready to eat package that was approaching its expiry date. Stone cold, the thawed potatoes were gritty & inedible and the 'coating' over these pieces of spud, defied any attempt to try and ingest even the first forkful. The partially chewed bite went straight into the napkin. The main course consisted of a cauliflower curry, with an overpowering single note of fennel served up with a greasy flat bread that reeked of vegetable shortening. The plain steamed rice was paired with a gritty dal, which seemed to be spiced with cardamom in a Gujrati style. While the spice level may be perfectly delicious on the ground, the altitude renders this extremely mild and the net effect is that of a bland offering which when coupled with the grittiness of the cooked lentil, makes this dish unpleasant to enjoy. 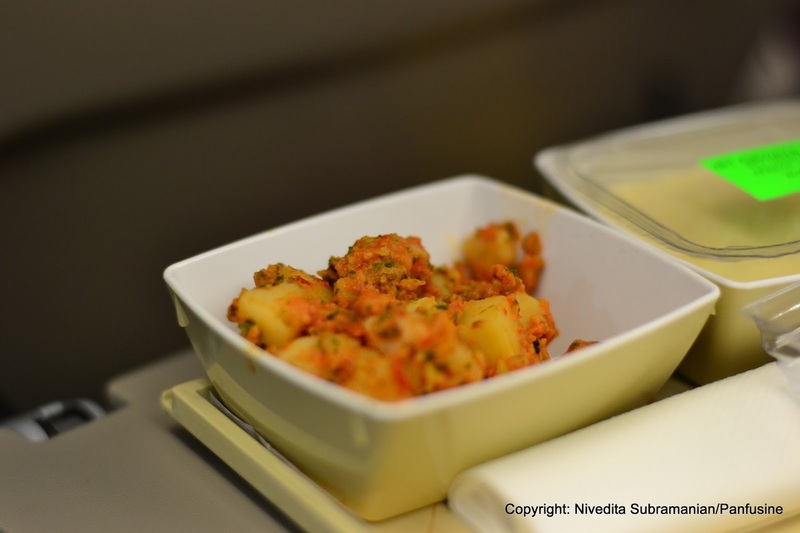 There is a reason why many in flight Indian vegetarian menus include Okra and Urad dal . Both have an inherent glutinous component that translates as a creamy texture on the palate. Have you ever pulled out a bowl of microwaved rice that's been sitting in the refrigerator for a day and tried to reheat it in the fervent hope that it reconstitutes into the fluffy satisfying form that it was when it was first cooked?. And invariably, chances are that it morphs into a gritty form no matter how much you mash it up. It doesn't take a rocket scientist to figure that out, leave alone a trained chef who is designing In-flight meals. And yet, the dessert offering on the tray was just that, a gritty tasteless mess of a paste with 3-4 slivers of fuzzy fruit peel that called itself Apricot kheer. The bowl of dessert was not even worth taking a picture of! 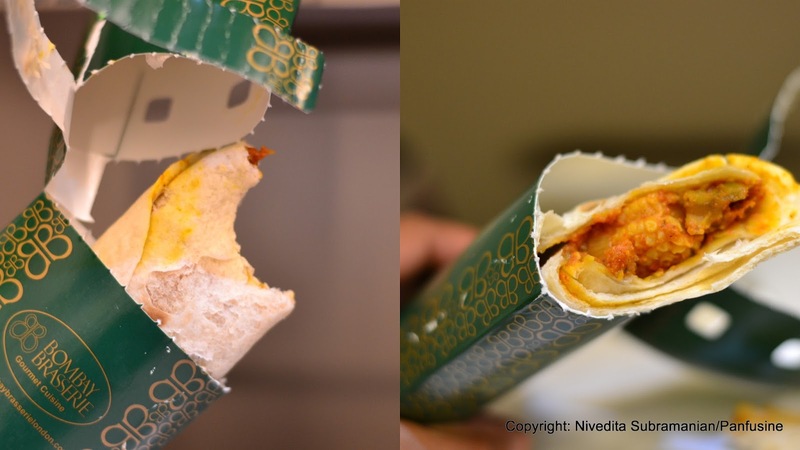 The prepackaged snack was a wrap with a curried baby corn filling. Pleasantly surprised to discover that there was an actual WHOLE baby corn nestled inside. The not so good aspect - having to ingest a generous amount of chewy par cooked flour wrap. This was quite possibly the best of the Bombay Brasserie offings though, there was a generous amount of the spicy curry and the bell pepper flavor stood out well. Looking forward to the offerings from Jet Airways on my return trip. 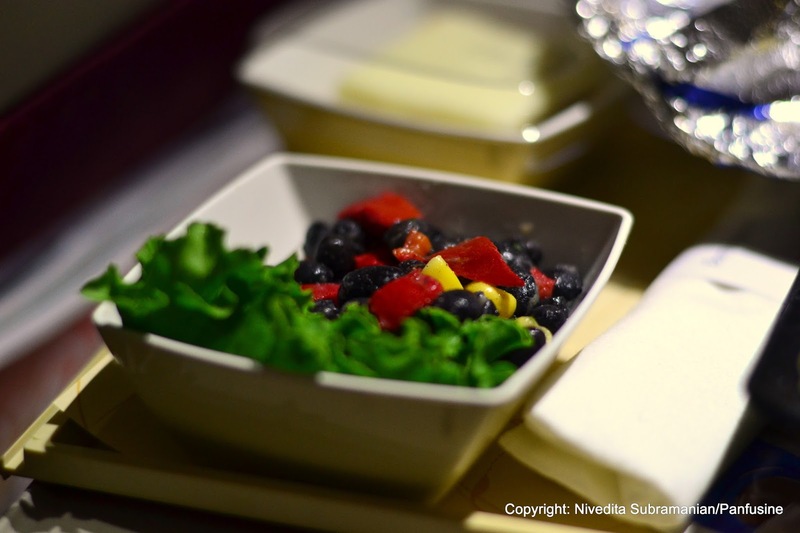 I amazed to taste the USA and United Arab Emirates airlines food. The foods are looked very tasty and yummy. I liked to eat spicy food. Thank you for sharing this tasty food.